Tam K takes on the Stanley vs. Craftsman war, or something equally superfluous. Her daughter returned to find sewage backed up in her bathroom at her barracks. The barracks chief provided the sailor and her roommate rubber gloves, scrub brushes and detergent and ordered them to clean it up. Both became ill, but the roommate recovered. "Whoever told those girls to clean up that bathroom, they have other people to clean those things up," she said. The woman's death is sad, the grieving understandable. However, thinking the military is negligent for having a servicewoman clean a restroom (raw sewage? You mean the toilets backed up? Heaven forfend someone less than a hazmat team tackle that!) and agitating (for a settlement? An apology from George W. Bush? A chance to be the Cindy Sheehan of sewage?) is not understandable nor does it elicit sympathies of any but a few with an existent anti-military doctrinaires. Like the editorial staff of the St. Louis Post-Dispatch, who runs these questioning stories relatively regularly. Just after it started raining Wednesday evening, Jeremy D. Evans, 34, of Imperial, ran his 1986 Ford F150 pickup truck into a tree. Allen's car left the road and hit a tree, police said. The car went off the left side of the road, hit a concrete median and came to rest on the left shoulder of the highway, police said. Also, note that the women were wearing seatbelts, which led to "moderate" injuries; the man, not wearing a seatbelt, also had "moderate" injuries, as though the consequences of ignoring the government diktat had no affect at all. There's just something slightly macabre about the little Gerber baby offering payouts if some disaster should befall your baby. The Senate legislation generally doesn't go quite as far. For example, illegal immigrants who are already born could go to college if they don't get in-state tuition. Why can't the unborn go to college with the in-state rate? Or is there an in-utero rate that's cheaper? Zookeepers were called in to help when police discovered a man-sized alligator in the basement of a Carthage home. Police found the American alligator while responding to a call about an apparent self-inflicted gunshot wound Monday. The remainder of the story discusses the efforts to rescue the animal. No word on the accident victim or attempted suicide. The man is just the man, but the alligator is an unspoiled child of Mother Gaia. I only wish I were kidding, but I think it does fit into the current inversion of values, where all things of nature are more valuable than damn, dirty humans. Prosecutors are not expected to file charges against a Missouri man who fatally shot his wife while he was trying to install a satellite TV system in their home. Henry County investigators ruled that Patsy Long's March 22 death was accidental. Her husband, Ronald Long, fired his .22 caliber pistol from inside their Deepwater home after he couldn't punch a hole through the exterior wall using other means. On one hand, I am being a little snarky because this seems so foolish as to be negligent, but on the other, I am happy to see prosecutors who can see an accident that doesn't want responsibility and a couple percentage points on their conviction rate. I do think a gun safety course might be in order, though, ainna? I love Mike Lupica's fiction, and this is the first of his nonfiction I've tried. Its subtitle is "How Sports Got Away From The Fans And How We Get It Back". I read it over the course of two nights, and each was different. I read the most of the book on the first night, and I almost felt like I'd been plagiarizing Lupica's points about sports since he wrote it in the middle 1990s, and I hadn't cared enough to make points until after 1999 or so. Still, he lays into the owners who don't understand the sport, city "leaders" that give rich owners what ever they want just to attract/retain a sports team for the prestige it gives the city and themselves, the players who are out for themselves at the expense of the sport and the fans, and the fawning media that offers little but rah-rah coverage and machismo posturing from its jock-wannabes sports reporters. So I was really into the book. On the second night, I got further into it and into some solutions. First, though, we have the problem of all the white people in attendance at the sporting events when most of the athletes are black and Hispanic. All righty then, I thought we'd covered that with the expensive nature of sporting events, but Lupica needed another chapter, so he introduces with a Bryant Gumbel bit about showboating as cultural and then goes into some sort of racial overtones of his own. And then he offers as a megasolution a consumers' watchdog group for sports fans headed by Ralph Nader (this, remember, is when he was a semi-obscure consumer advocate before he became a semi-obscure presidential election spoiler). Ultimately, the book is a bit repetitive at the end and really seems to want some sort of macro-level top-down solutions to the crisis in sporting, but ultimately I think that the problems inherent in the sports world are reflections of the diminishing class in the country at large. So having a special commission or board of fan poobahs along for rules changes or whatnot would really only give a set of corruptive influence to another set out people who would ultimately lack class and would act in their interest as board members instead of fans. So my enjoyment of the book is not unqualified, but since I agree with many of the viewpoints, I appreciated seeing them represented in print by someone I enjoy reading. Get Offa My Lawn, Etc. Older than Dustbury. Older than his source. I'm probably just lucky the quiz only included questions about 20th century pop stuff, or I might have been an ancient. Clayton turned down a request last fall by the developer to include the land into an adjacent tax increment financing district. Of course, my inner cynic (inner cynic? It's showing all the freaking time) says this is only because the Soviet of Clayton has a better 10-year plan for a different TIF district gift to a different developer that includes the other land, but maybe, just maybe, Clayton is holding a line. The districts - Kenosha, Kimberly Area, Waukesha, West Allis-West Milwaukee and Whitefish Bay - have piled up debt in deals to help fund health insurance and other non-pension benefits for retirees. But as global financial markets have seized up, the districts have been told the value of their investments has fallen so much that they might need to come up with a combined $53 million to avoid default. Ah, what the heck, it's funny money anyway, right? The taxpayers always have more. In the midst of reading a Jane Austen novel triggering an Anna Karenina moment, I read this collection of Dilbert cartoons from a decade ago. Dilbert's comedy level is pretty good and pretty consistent, and fortunately the corporate world has continued to live down to the comic strip's estimation. What more insight into it do you want? It's Dilbert, for crying out loud. Thank God He's Not A Country Boy This weekend, someone posted a bit about how Barack Obama should take note lessons from Hank William, Jr.,'s "A Country Boy Can Survive" to court the rural vote. As someone who listens to Hank Williams, Jr., for pleasure, I'd have to point out that Barack Obama could not actually adhere to the philosophy the song encompasses. Let's do a line-by-line of the lyrics, shall we? For starters, this line indicates going to church, and many of the Democrat leaders only appear in church around election time. Some of the most faithful Democratics I know in the urbanati are active, enthusiastic atheists. So this line and its millenial, evangelical preacher man don't conform with many Democrat candidate leanings, much less Obama's--who has preacher man problems of his own, as those who dwell amongst the blogs know. A good environmental millenialism. Democrats already tap into the global warming/environmental disaster meme, but so does McCain (sadly). So Obama has nothing to learn here. Well, this economic malaise millenialism fits a Democrat theme, but it doesn't hold terribly true according to current metrics. The interest rates are way down, and the stock market is a bit behind, but not far off. The song was originally recorded in 1981, and the economic malaise was inherited from Carter (D) with the conditions. Put that sweater on and shiver in it. Now, we have a bit of a disconnect. The fear of crime and a strong law-and-order impulse are mostly Republican weighted issues. City cores and the urban rulers and voters trend Democratic, so some suburban types (such as me) see the hellholes in cities and think they're problems caused by Democratic policies until a Giuliani cleans them up. Banging a drum too loudly about how screwed up cities are might draw attention to how they got that way. A nuclear family. Sounds good. But who is it that mocks family values? Oh, yeah, the urbanati. Guns and a fuel-consuming sport utility vehicle (with dogs and kids, I'd picture a Chevy Blazer). Any urbanati Democrat candidate that espoused these would look foolish and somewhat hypocritical. Like Obama is doing now. I don't think this is what the urbanati care about. All they care is that the rural folks fail to outvote their urban voters, who will probably go Democrat anyway. As Kerry and other urban Democrat candidates know, regaling voters with stories of harvesting grain or being lifelong hunters doesn't work, since you're likely to make a gaffe or slip into cornpone accents. Whereas Obama might appreciate a good homemade smoke, Democrats aren't terribly interested in unregulated craft manufacturing. None of our government officials are, really; if there's a lobbying group that wants to keep upstarts out, the government leaders pass certification and licensing laws. Never mind that; what else are we talking about here? Ah, yes, smoking and drinking, the new anathemas to modern urbanati living, which must be banned in as many locations as possible. Which is "all" to some minds. The song is an anthem to self-reliance. Growing your own food and making your own booze? But Democrat initiatives don't expect that much of constituents. No, instead, here, have some free money and free cheese. Vote for me, and next time it's more free money and maybe some chicken. Please don't spend that money on seeds, or we'll cut your benefit. Resilience and tenacity. Put some bombs bursting in air, and you've got "The Star-Spangled Banner". No, the Democrat frontrunners come from the cities and other urbanati enclaves in academic environments. Saying you're authentic or that you've worked for a living won't make it so, so let's not just drop a hard hat with a carbide lamp on you for a photo op, okay? Skinning Bambi? Catching fish? Hurting Mother Gaia's more important children? Okay, I'm adding urbanati hysterics for fun here, but a lot of urbanati want to limit hunting in myriad ways. I don't know Obama's voting record on these issues, but I'd guess they're either "Present" or not against the limitations. That's actually probably in line with urbanati conversation, although "redneck" has replaced hillbilly as the appellation for choice for those not fortunate enough to live amid the concrete warrens of the like-minded. An exchange of the "service economy" versus people who actually make stuff for a living. A photo for a product. To the urbanati, that's a good exchange. Perhaps Obama has already tapped into this, offering style instead of substance. Again, the crime in the city. The Ed Koch years. Remember the 1970s and 1980s and the New York City of that era? Yeah, to urbanati of a certain age, living there amid the crime and the crumbling gives them credibility. Unfortunately, Obama's not that old. Banging the drum of street crime won't endear him to the urban vote. What, with a handgun? Citizens cannot be trusted with handguns. Just lock yourself behind a hollow core closet door and call 911. Then your survivors can lose a lawsuit because police do not have a duty to protect any individual. 'Cause we're them old boys raised on shotgun. And if you ain't into that we don't give a damn. I don't think there's much in the song for Obama to embrace, authentically and sincerely. The Democratic Party encourages dependency, more than even the other party that encourages dependency upon its largess when in power. Strong libertarian messages coupled with a marked belief in traditional values won't sound right coming from Obama's mouth, not if he's also professing to be the fount of all change and goodness and impending utopia. That is: A recession would have a positive impact on the obesity epidemic in America! I mean, if you're tightening your belt, you're losing weight, am I right? Apparently, the Post-Dispatch thought it over and didn't want any positive spin on it at all, which is why the story is entitled As the economy slips, consumer face tough choices. Still, a recession or, even better, a depression, would get Americans back down to sustenance level calories, which would no doubt prepare us for a post-Kyotoesque-treaty economy. So this weekend marked the first really dangerous book fair of the season: The St. John's United Church of Christ book fair. 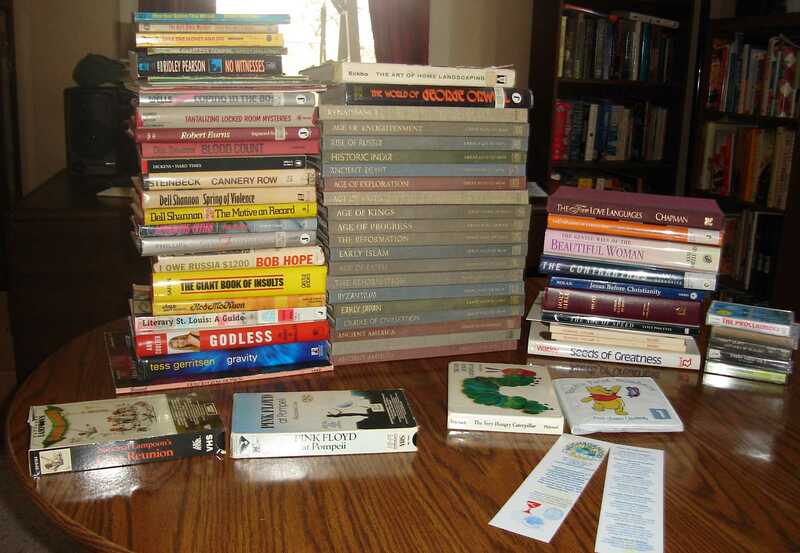 We went to this one last year, so I knew what to expect: I picked up a box right when I went through the door instead of pretending I was only going to buy one or two things and then picking up a box after I accumulated a dozen books. 19 volumes of the Time-Life Books series The Great Ages of Man. Okay, it's apparently 18 volumes (1 duplicate) from the (I know see) 21 volume set. Still, a nice primer on some history stuff. Good idea books, I hope. As I get older, I'm acquiring more and more of these sets so that I or my children will have them to kind of page through in a way you really can't with Wikipedia. A couple Dell Shannon mysteries. He wrote mysteries in the 1960s where the crimes are all fairly minor. They're police procedurals, and sort of pastoral police procedurals now. A couple of Mike Shayne paperbacks. Good, short pulp bits that I cut my teeth on when I was a lad. The April Robin Murders, a paperback co-written by Ed McBain? Take the Money and Die, a paperback mystery I bought simply because it was that close to the others I picked up. Seriously. Collateral collectage. No Witnesses by Ridley Pearson, a writer from the next suburb whose work I have yet to read. I own one of his books in Swedish, so it's nice to have something by him that I can read. A stack of gardening books because I've planted some things. Most of them are small, brochurish things from the 1940s and 1950s. Coping in the 80s because I want to see how I managed. A biography of Robert Burns because I don't already have one. Dickens's Hard Times and Steinbeck's Cannery Row to pile onto my classical material. A couple of Rod McKuen books, Lonesome Cities and And to Each Season, so I can screw up the next childright from birth, too. On Flirtation, a psych book about flirting. A book by Bob Hope from the 1960s. You know, I've not read any book by him. He can't be worse than Sinbad or Judy Tenuta. The Giant Book of Insults because I have a long list of people to insult. Literary St. Louis: A Guide. Ironic, isn't it, that I'm actively catching up to William Gass (I hope) with one of his books? Godless by Ann Coulter. It's worth a buck, and she's not getting any portion of it. Gravity by Tess Gerritsen. At the checkout, my wife said she already owned a copy. However, she is not me. Now I own a copy and will read it, eventually. The World of George Orwell, a picture and sort of bio of Eric Blair. Because (say it with me), I didn't own one already. I also got two videocassettes, National Lampoon's Class Reunion and Pink Floyd at Pompeii. They were $2.00 each; had I known that, I would not have gotten the first. Had I seen it before I bought it, I wouldn't have spent another dollar on it. Total spent: $61.75. Total books for me: 48. Total for household: 61. Looks like I'm going to have to forgo some heavy reading for a bit to clear some of the backlog. And the Old Trees and Kirkwood library friends, not to mention the Carondolet Y book fair, are still to come this year.